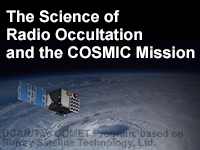 The lesson provides an overview of radio occultation and its contributions to our understanding of Earth's atmosphere as demonstrated by the COSMIC mission launched in 2006. The lesson is divided into three chapters: Chapter 1 describes the science of radio occultation and how atmospheric profiles are obtained. Chapter 2 focuses on the benefits of radio occultation and COSMIC observations for numerous applications related to meteorology, climate, and space weather. Chapter 3 describes the COSMIC-2/FORMOSAT-7 mission and its expected improvements to further inform meteorology, climate, and ionospheric applications. Each chapter contains optional In-Depth materials providing a more advanced look at that topic. Proceeding through these materials will add to the time required to complete the lesson but will result in a greater understanding of radio occultation technology and its applications. All the information I learned will be useful in a new postion I am occupying since January 2018. This is a great job.